Under ordinary circumstances the City may not enter into a contract with a vendor when the City finds that the vendor is not responsible because of tax, criminal, financial, ethical or performance reasons. It may not always be in the City’s interests, however, to refuse to deal with the vendor. One option available to the City that allows the City to continue to do business with such a vendor is an Independent Private Sector Inspector General Agreement, a so-called IPSIG. An IPSIG is an independent, private sector firm that has legal, auditing, investigative, and loss prevention skills, and which is employed by a vendor to ensure the vendor’s compliance with relevant laws and regulations, and to deter, prevent, uncover, and report unethical and illegal conduct by and within the vendor. IPSIGs are often staffed by former law enforcement and investigative personnel with expertise in detecting and preventing fraud. The IPSIG staff works with management to monitor, investigate, audit and analyze the business and operations of the vendor. 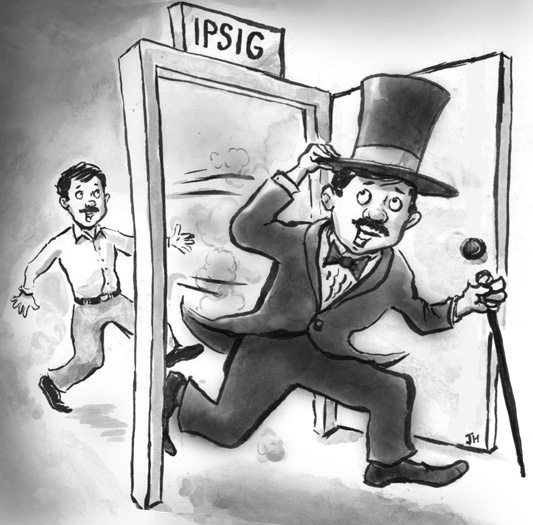 An IPSIG might also be referred to as an integrity monitor or independent counsel. In 1996, the City’s Department of Investigation created the City’s IPSIG program to permit the City to enter into contracts with companies that might otherwise be precluded from doing business with the City due to integrity issues. Under the IPSIG program, vendors may be awarded a contract as long as they agree to be monitored by an outside, independent company. The Procurement Policy Board subsequently adopted PBB Rule §2-08(p)(3), Rehabilitation of Vendors, which formally acknowledged and set forth the procedure for imposing an IPSIG. Under the PPB rule, the Department of Investigation must consent to the involvement of an IPSIG and to the particular responsibilities set out in an agreement with the vendor. In general, the IPSIG reviews the vendor’s business practices, oversees its performance, and develops specific remedies with respect to the subject matter of the non-responsibility determination or caution. An IPSIG may be hired voluntarily by an organization or it may be imposed upon a vendor by compulsory process such as a deferred prosecution agreement or by government contracting rules. 9 RCNY §2-08(p)(3). The IPSIG’s fee is paid by the vendor or contractor, but the IPSIG reports periodically to the government agency or prosecutor. It is a means by which scrutiny can be applied to a troubled business entity without the government having to deploy limited manpower and resources to ensure compliance with legal and ethical standards. IPSIGs do not perform a managerial function. Rather, an IPSIG monitors the activities of the entities management. If the vendor is open to reform, the IPSIG may also work with management both to reform corrupt practices, and also to enhance productivity through the development of programs and procedures. If, however, the vendor is less willing to change its practices, the IPSIG’s role may be essentially adversarial and limited to monitoring the activities of the vendor and instituting internal controls to prevent bad behavior. The IPSIG concept first arose in 1990 when the New York State Organized Crime Task Force issued a Final Report on Corruption and Racketeering in the New York City Construction Industry. The Report first raised the idea of adapting the City’s existing inspector general program to contractor’s fraud against the government. DOI, as part of its regular functions, appoints City employees as agency inspector generals. These inspector generals report to the DOI commissioner and are independent of the City agency to which they are assigned. The Crime Task Force Report recommended that in carrying out public works projects, City agencies could similarly require private companies under contract to the City to hire private sector certified auditing firms to prevent and uncover fraud and help contractors comply with laws, regulations and accounting requirements. These monitoring firms would be independent and licensed by DOI with investigative, auditing, loss prevention, engineering and other skills necessary to oversee on-site construction activity and record keeping practice. a requirement that the contractor’s owners, employees, officers and directors report to the IPSIG and the City any illegal or unethical conduct with respect to any city contracts. The IPSIG in addition was given wide investigative authority. It could monitor and investigate any actions, conduct, operations, or omissions of the contractor, or any of its officers, directors, principals, employees, or affiliated companies or entities, that, in the judgment of the IPSIG or the City, related to vendor responsibility. The contractor, to assist the IPSIG’s work, was required to provide access to all books, files, accounts, computer records and correspondence. The contractor also authorized the IPSIG to report immediately to the City and to appropriate law enforcement authorities, without notice or disclosure to the contractor, any suspected or actual criminal activity, unethical or irregular business activity on the part of the company, its employees, officers, directors, subcontractors, suppliers and vendors, or labor officials. By entering into the monitoring agreement, the City was able to reinstate a substantial construction company that was highly regarded for the quality of its work and for its low bids. The City also ensured the continued existence of a competitive bidding environment by permitting a competent contractor to remain an eligible bidder. Another early adapter was the School Construction Authority. In the late 1990’s the SCA used an IPSIG with a major construction company which had submitted the lowest bid in a large school construction project. Disqualifying the firm would have compelled the SCA to pay more to the next highest bidder, create layoffs, and limit the number of large firms bidding on other school projects. The SCA and the contractor agreed that the IPSIG would work with management to develop a code of business conduct, perform compliance audits, design and implement internal controls to prevent fraud, waste and abuse, and establish an integrity hot line available to employees to report illegal behavior of the company anonymously. IPSIG’s have been used in a variety of situations to allow vendors to continue doing business with the City. Monitors have been used in the City’s Build it Back program after Superstorm Sandy to monitor the contractors’ billing of work which was billed on a time and material basis. The Department of Education has utilized IPSIGs for several bus contractors, while the City has used IPSIGs when contractors failed to comply with contractual requirements to hire minority- or women-owned businesses. IPSIG’s can be used to prevent fraud even in the absence of previous wrongdoing. This potentially saves the government money and helps assure public confidence that government efficiently provides services and improves infrastructure. During the 9/11 World Trade Center clean-up, Mayor Rudolph W. Giuliani, upon the advice of the City’s Department of Investigation, appointed individual integrity monitors to oversee the work of the four construction management companies which were supervising the debris removal effort. The contractors were Bovis Lend Lease, AMEC Construction Management, Turner Construction and Tully Construction. The monitors appointed were Thacher Associates, Steir, Anderson & Malone, Decision Strategies/Fairfax International and Getnick & Getnick. Because this construction work was billed on a time and materials basis, there existed a risk of costly abuse and fraud. The four integrity monitors each operated like an IPSIG, utilizing legal, investigative, auditing, and loss prevention skills. The appointment of the integrity monitors to oversee the World Trade Center clean-up project resulted in cost savings and the prevention of criminal conduct at the site. The IPSIG will establish and maintain internal controls designed to deter unethical or illegal conduct, and will report any unethical or illegal conduct observed to the Commission. The IPSIG will examine the operations of the stevedoring companies to ensure that they run effectively without fraud, criminal influence, improper accounting and/or hiring practices, or other malfeasance. The Commission may require a stevedoring company to retain an IPSIG pursuant to a responsibility agreement or stipulation with the Commission, in order for the stevedoring company to continue to operate in the Port. Upon selection by the Commission, the IPSIG will be hired by the stevedoring company but will report directly to the Commission, with the stevedoring company retaining responsibility for payment of the IPSIG services. Id. at 188. The hallmark of an IPSIG is its independence. This is spelled out in the Code of Ethics, instituted by the International Association of IPSIGs that governs the conduct of IPSIGs. Even when an IPSIG is voluntarily hired by an organization, it remains independent. It is responsible to the public as well as to the monitored company. Without objective judgment, the IPSIG would lack credibility. Increasing numbers of monitors have been voluntarily hired and not imposed by the City. For example, waste management companies have used IPSIGs as a marketing tool to remove some of the stigma of operating in a traditionally corruption-riddled industry. Certain construction, gambling, investment firms, utilities, health, education and real estate firms have also independently hired IPSIG’s. Some companies facing financial difficulties or who are under investigation by law enforcement agencies hire monitors to assist them in the process of regaining legitimacy. Vendors, for example, might employ an IPSIG because former employees had committed criminal acts. The company can be awarded public contracts often at considerable savings to the government in circumstances in which they would otherwise have been disqualified. The independent hiring of an IPSIG by a company, however, may not foreclose the City from requiring the entity hire an IPSIG chosen by the City. In certain circumstances, the City may rely on certification agreements or corrective action plans. PBB Rule §2-08(p)(3) allows for vendors to enter into certification agreements with DOI prescribing corrective actions and appropriate remedies for situations which would otherwise warrant a non-responsibility determination of caution. Depending on the nature and severity of the wrongdoing the City might require both a certification agreement and an IPSIG. Certification agreements have included requirements that the vendor adopt a code of business ethics promoting a zero tolerance policy against giving or accepting gifts, and annual certifications by the vendor that the vendor’s employees have not committed any wrongful acts while working in the scope of their employment. In some circumstances, subcontractors have been required to enter into certification agreements in order to work on a City contract. The City has required some vendors, more often in the non for profit sector, to enter into corrective action plans with the City. Sometimes service providers are well-intentioned to provide important social services, but do not have the experience or procedures in place to run the financial aspects of the business properly. A corrective action plan may require that the vendor institute training courses for its employees, corporate governance plans and policies to prevent conflict of interests, whistle blower protections, and fiscal policies and procedures. Some of these plans have required entities to hire accounting firms to conduct an internal review of the entities business practices. IPSIGs are good for government and an excellent vehicle for vendors and contractors to rehabilitate their organizations and allow them to be eligible to be awarded contracts. In light of the government’s limited resources, IPSIGs act as eyes and ears in monitoring entities that may have committed illegal and unethical behavior in the past, but which have the potential for reform and which provide important services to the public. The appointment of an IPSIG provides the opportunity for a vendor to stay in business, implement programs to prevent illegal and fraudulent practices by instituting policies and safeguards that are designed to prevent illegal behavior and allow the company to remain an active City vendor. Rich Schulsohn is a Deputy Chief in the Commercial and Real Estate Litigation Division of the New York City Law Department. The information, views and opinions expressed are those of the author only and do not necessarily reflect the views and opinions of the City of New York or the New York City Law Department.